Home » Spero G Karas M.D. About Spero G Karas M.D. Dr. Karas joined the Emory Orthopaedic & Spine Center in 2005 as Director of the Emory Orthopaedic Sports Medicine Fellowship Program. In addition to this role, he currently serves as the head team physician for the Atlanta Falcons, the team orthopedist for the Atlanta Braves, and is a consulting team physician for Georgia Tech University, Emory University, Oglethorpe University, Georgia Perimeter College, and Lakeside High School. Prior to this, he served as chief of the Shoulder Service, team physician, and director of the Orthopaedic Sports Medicine Fellowship at the University of North Carolina at Chapel Hill Department of Orthopaedics. Dr. Karas received his undergraduate degree from the University of Notre Dame, and his Doctor of Medicine degree from Indiana University School of Medicine. After medical school, he completed a residency in Orthopedic Surgery at Duke University Medical Center. After residency, Dr. Karas completed a Knee, Shoulder, and Sports Medicine Fellowship at the prestigious Steadman Hawkins Clinic in Vail, Colorado. While in Colorado, he served as an Associate Team physician for the Denver Broncos and Colorado Rockies professional sports teams. He is the author of more than 250 publications, presentations, and demonstrational videos. He has trained over 75 residents, fellows, and graduate students in subspecialty care of the shoulder, knee and sports medicine. 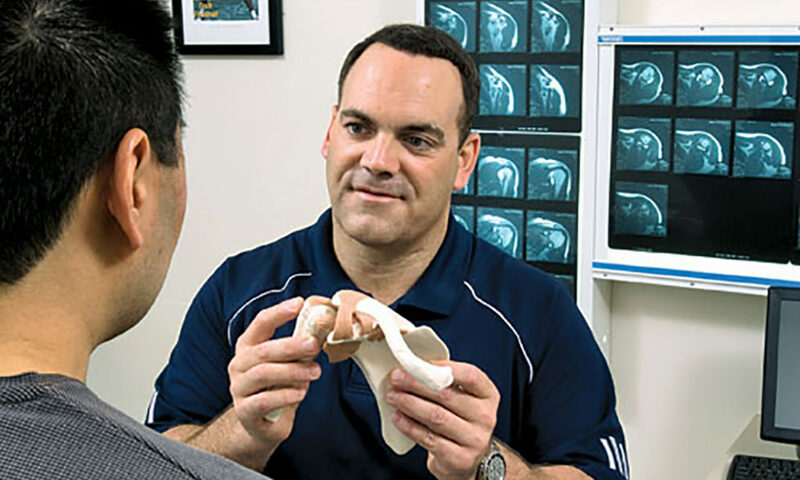 His research has been published in numerous journals, including the American Journal of Sports Medicine, the Journal of Arthroscopy, the Journal of Shoulder and Elbow Surgeryand the Journal of Orthopaedic Trauma. Dr. Karas is certified by the American Board of Orthopaedic Surgery and has held leadership positions in numerous societies, including the American Orthopaedic Association, the American Academy of Orthopaedic Surgery, the Arthroscopy Association of North America and the American Orthopaedic Society for Sports Medicine. Dr. Karas is a recognized expert in the field of shoulder surgery, knee surgery, and sports medicine, and has been awarded numerous grants for research and product development. A frequent speaker throughout the United States and internationally, his work has been featured in Ski Magazine, Men’s Health, and on NBC, FOX, and CNN network television. He is also active in quality musculoskeletal research, and has been honored by his peers with nominations for numerous research awards. He actively collaborates with medical corporations by developing cutting-edge technology to improve the instruments and techniques in orthopedic surgery. Dr. Karas was selected as one of America’s “Top Sports Medicine Specialists” in Men’s Health Magazine. He has also been named one of the “Top Sports Medicine Doctors for Women” by Women’s Health magazine, “Best Orthopaedic Surgeons in America” by Castle Connoly, and the most trusted sports specialist in Atlanta, Georgia by Atlanta Magazine. Dr. Karas is a full member of the American Shoulder and Elbow Society, a prestigious “invitation only” society with rigorous selection criteria. There are only five members in the state of Georgia, and only one other in Atlanta. A former collegiate athlete himself, Dr. Karas was a varsity letterman in wrestling at the University of Notre Dame. He continues to participate in sports such as golf, skiing, snowboarding, and fitness training. He also coaches little league sports, and is an active member of his church and community. Dr. Karas and his wife, Johanna, are blessed with three very active and beautiful children – Gus, Elena, and Nicholas.